How my current desk setup is looking at home. Note: If you would like an overview of all the tools I use, head on over to my /uses page. On first install, none of the above is setup. Instead, Notion allows you complete freedom to setup the categories based on what you need it for and within each category, describe the type of data you need, along with various relevant views of that data. It's incredibly flexible. All that's required from you, is some thought into how Notion can work best for you. 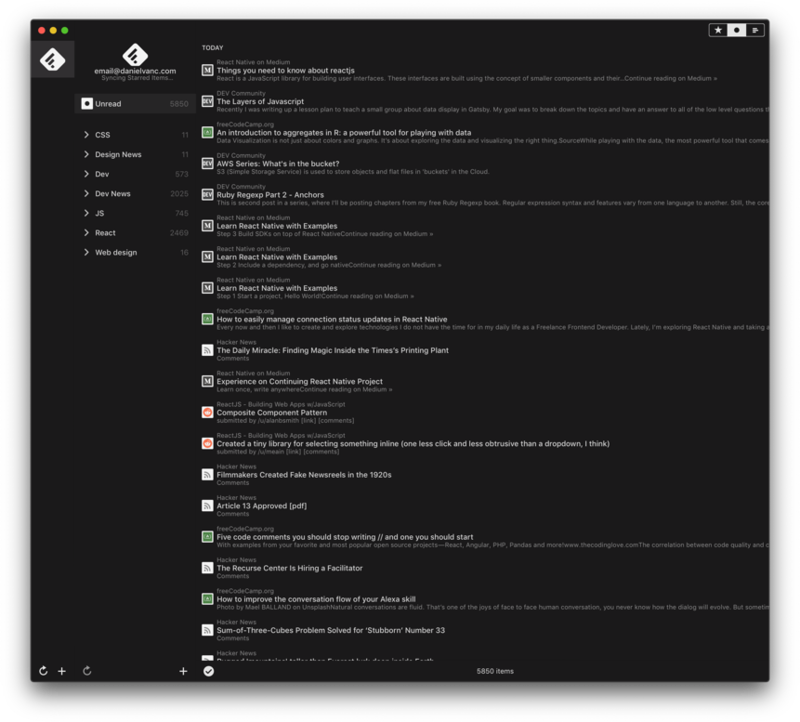 I particuarly like how I've got everything on the home screen and I can easily see where I need to go without having to dig through multiple tabs or processes to get what I need. 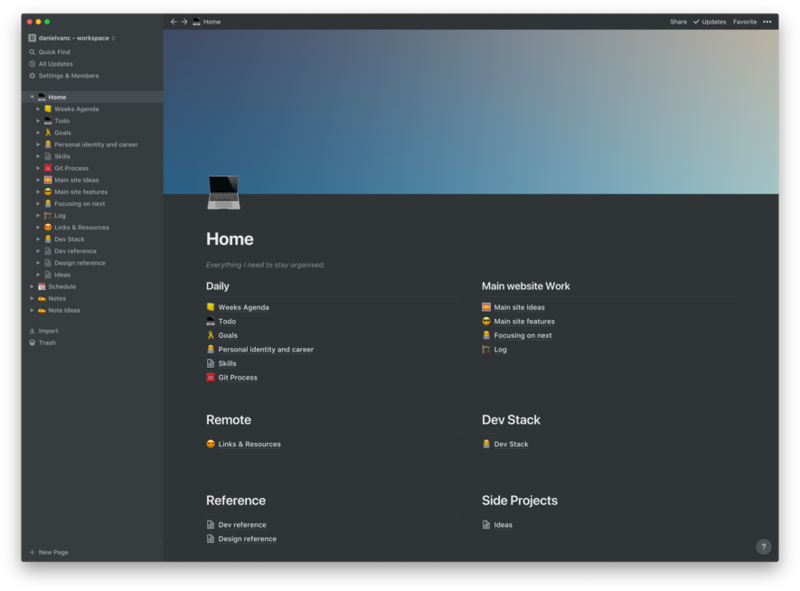 Notion is kept open and running all the time, on my first Desktop space, so each time I log on-to my Mac, it's there instantly and I can immediately see what I need to do for the day/week. I consume allot of content on the Web. Mainly to do with my profession. And technology in general. So therefore with those fields, it's a job in itself to keep up with everything that's going on. I had to come up with a process in a way that works without feeling overwhelmed with it all. A method I've been trying for the past year or so, seems to be working well. It's a combination of things. When I'm just browsing the web on Mobile, I'll stick with Safari as I enjoy the reading tools it provides built in. If i see something that might be worth reading for later (to read fully), I'll add it to Safari's reading list. After browsing, I'll look at the bookmarks to see if the content is worth my time. If so, I'll move it to my Pocket app. Where I later set aside time to read all content added to this. I will then scan all the headline and descriptions, and if any look promising, i'll skim the article itself in Reeder and then decide if it's good content which is to be saved to Pocket. What I'm left with then is content in my Pocket app that I have already collated as worthy reading, and so it's just a case then of setting aside a chunk of time each day (usually in the evening) to read them. Going forwards, I've started to collate some of those and provide for you my best 12 reads for that month. That's all for now, keep an eye on the site for Part 2. Which should be available mid april.